Kelly Davio serves as Managing Editor at The Los Angeles Review and reads poetry for Fifth Wednesday Journal. She is the author of Burn This House, forthcoming from Red Hen Press (2013). She is a three-time Pushcart nominee whose work has appeared in Gargoyle, Pank, The Cincinnati Review, Women’s Review of Books, Best New Poets 2009, and others. She holds an MFA in poetry from Northwest Institute of Literary Arts, and teaches English as a Second Language in Seattle, Washington. Kelly Davio: [It] was established in 2003, as a part of Red Hen Press, with the mission of becoming is the literary voice of Los Angeles, and the voice of the nation. 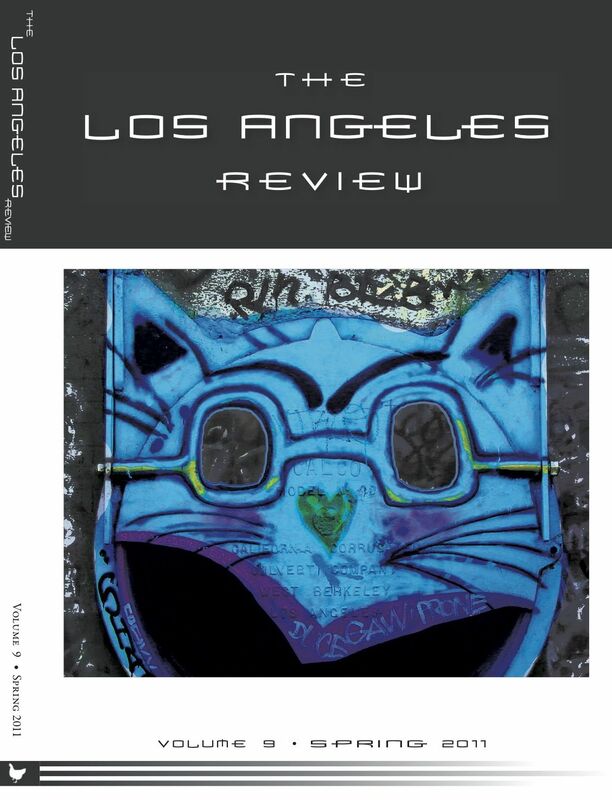 Weighing in at around 300 pages per issue, each edition of LAR includes poetry, fiction, creative nonfiction, interviews, book reviews, and a profile on a West Coast author who has made a significant contribution to American Letters. KD: I’m originally from Southern California, but today I live in Seattle, Washington. While we’re an LA journal, and our editors all have roots in Los Angeles and the West Coast, we are a far-flung group of people, with editors as far away as Detroit. KD: I’m not sure we fit into publishing as much as we make room for ourselves in publishing! We’re a journal that challenges old guard publications with fresh, provocative, distinctly West-Coast ideas and writing. We’re not an academic publication, nor are we a journal of writing for writers. We’re a reader’s magazine, bringing the best, most thought-provoking material to our audience. KD: One of the foundations of our journal–one we’re very proud of–is the fact that each issue is dedicated to a West Coast writer who we feel is under-appreciated. The issues feature important pieces by, interviews with, and a critical introduction to these writers. We’ve dedicated recent issues to Wanda Coleman, Juan Felipe Herrera, Judy Grahn, Bruce Holland Rogers and Ishmael Reed, to name a few. KD: I think the importance of literary journals cannot be underestimated; in a commercially driven publishing world in which vampire romance rules by the power of the dollar, literary journals are custodians of the language. It’s our privilege, and responsibility, to identify promising new talent–and support established talent–by bringing writing of the highest quality to a wider readership without sacrificing finely crafted work on the altar of Barnes and Noble and the bottom line. KD: At LAR, our foremost concern is craftsmanship in literature. Whether it’s a sonnet or an experimental prose poem, a piece of flash nonfiction or a 10-page short story, the backbone of LAR is quality execution of the craft. Some representative authors include Terrance Hayes, Lucia Perillo, Dana Gioia, Barry Lopez, Benjamin Percy, Lydia Davis, and Michael Czyzniejewski. But that’s not to say only such established writers have a place in LAR; each issue also includes work from poets and writers making their print debuts. We’re particularly interested in publishing voices that might not be well served in by other publications–we welcome LGBT, minority, and women writers, who may not find other venues in the publishing world too friendly to their work. KD: We accept online submissions via Submishmash (see www.losangelesreview.org) or via email. We require no reading fees. Our submissions periods are rolling, currently open until June 1, 2011. Nonfiction: We seek essay, memoir, and commentary told as compelling, focused, sustained narrative in a distinctive voice, rich with detail. Send 1,000-4,000 words or delight us with flash nonfiction that cat-burgles our expectations. Fiction: We’re looking for to hard-to-put-down shorties under 500 words and lengthier shorts up to 4,000 words–lively, vivid, excellent literary fiction. Poetry: Please submit 3-5 poems that will surprise us, wow us, and make us wish we’d written them ourselves. We are open to form, free verse, prose poems, and experimental styles. Our only criterion is quality. Translations: Please submit 3-5 translated pieces that open the writer’s original vision to an English-speaking audience; the writing may include poetry, novel excerpts, short stories, essays or interviews. We do not consider work that has been previously published in English translation in the U.S. Please provide a biographical summary of the author and enclose a copy of the original text. Translators must obtain copyright permission for work to be published. KD: That literary journals and small presses are endangered is a given (especially for journals like LAR, which have no academic affiliation and receive no outside funding). But if every person who wanted to be published in journals actively subscribed to a just two or three publications (and if those whose budgets are very tight went in on a subscription with a writer friend or friends), journals would be in vastly better shape. There’s quite a glut of people out there who are interested in being celebrated in print, but who aren’t interested in supporting print. KD: I don’t think of online publishing as a threat, per se, but I do feel that there are some online publications that lack a sense of permanence or of attention to visual aesthetics. LAR is a big old brick of a book, and we put a great deal of care into making sure it’s also a beautiful object–that it feels great in the hand, that it’s beautiful to look at, and that it does visual justice to our authors’ work. There are online publications, and I’ll refrain from naming names, that throw a poem up in 14-point courier and call it a day. A quick publication, sure, but is anyone going to love that? To cherish it as an object of beauty and permanence? Or is it going to disappear into the ether of the internet? If online journals can find a way to do justice to literary work aesthetically and can keep that work around, then I think online only publishing has the potential to be a great thing. Online publishing has the opportunity to be more agile than print, though, and can absolutely fill certain cultural space all its own. HTML Giant and The Rumpus come to mind as very smart, very relevant venues that don’t supplant the literary journal, but work symbiotically with it. I hope to see many more similar venues bring arts and culture to a broader online audience. KD: I’m not sure journals are a Darwinian thing. I think only the loved will survive. Maybe not the fittest, but the loved–the journals that spoke to something important, relevant, and human in their readers. That said, there is a life cycle to every journal (I recently read that the iconic Open City is shutting down after many wonderful years). I don’t expect that LAR will be around forever. I hope it goes on for decades and decades, but there’s no certainty to any endeavor’s longevity. The best we can do, I think, is to make sure we say something important while we’re around. KD: I think we’re about to see some big changes in the small press world (just as we are in the larger houses). I’m not entirely sure the small press at large is equipped for ebooks, iPad apps, and the other exigencies of digital media, but if it opens up new avenues for serious literature to be read by the masses, then I’m all for the digital revolution. Once again, though, I’m concerned that there could be a lack of permanence and quality in the work we see published digitally. But I have no doubt that the real players among small presses, like Red Hen Press, Copper Canyon, Graywolf, and Milkweed Editions will continue to make beautiful books, whatever the format. KD: I wasn’t familiar with you before, but I’m grateful for the introduction! I look forward to reading your review, and wish you all the best with your writing, editing, and service to the literary community.